LOL now thats clever! Keep em coming! I had the Flu. Did terrible for a week, then annother week was bad, and then I was fine. That week did feel like three months, though. I bet if Biff got the swine flu, he’d turn pink and grow a snout. I may or may not have had it, either it was swine or regular, but I never get shots, and I’ve never really had the flu before, but this year I got one, just don’t know which, half a week though and I was fine, saturday-tuesday, only lingering effects were coughs for the next 2 weeks. I personally never get flu shots. But then I’m terrified of needles. Besides, I get the flu twice a year, and have for a few years now. I’m miserable for a day or two and then I’m pretty much fine now because I guess my body knows how to deal with it. I can’t believe that I’m somewhat emotional over the paper people and their “expressions”. I guess I’m just a very emphatic guy. I can understand that some people may need the vaccine though. Did anyone else saw the paper figures and thought, ‘paper boyband!’, or is it just my weird imagination? I got my shots this year, and for the first time, because when I do get ill I’m coughing for months afterwards–I have asthma. I’ve spent the last two days with a mild cold, it hasn’t gotten worse, symptoms just annoying–headache, throat barely sore, sneezing–and it’s going away. Much better than spending three months with a wheezy, hacky cough from it irritating my asthma. Many people doesn’t know the difference between ‘flu’ and FLU. The first one is not actually flu, it’s only common package of viral and bacterial infection, known as ‘cold’. But the second one makes you to stay in bed for a week or two and do nothing but sleeping and staring at TV or ceiling. I’m glad I haven’t caught the real flu for 10 or more years..
I’m one of those people who only get the Flu once every 3 or years. When one of the little buggers does manage to get past my immune system though it’s always one of those nasty 4 or 5 days versions where the only two places you see in your house are your bed and the bathroom, and it takes a week to recover from. lol I’m totally digging BOF for the past few days. Clever stuff! Paper art week, or paper cuts week maybe?? Every time I get a cold, which is VERY seldom, I just tank up on Vitamin C tablets and orange juice, and it gets kicked to the curb. I don’t think I’ve had a flu shot in over 20 years now – heh. 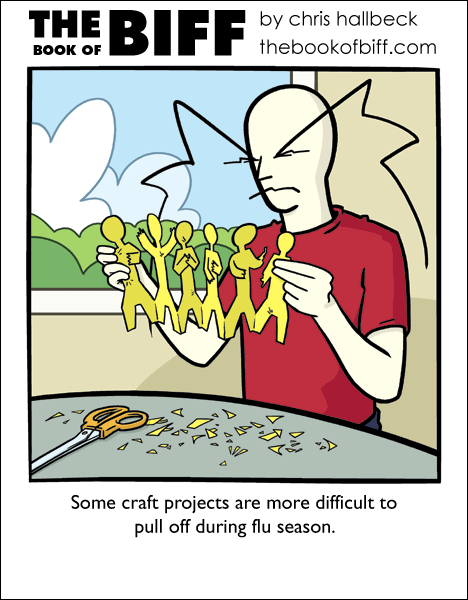 It looks more like the paper men don’t want to hold hands as they usually do for fear of getting the flu rather than Biff sneezing and mauling the little guys; I like my story :). @Random – Who said your story was incorrect? Sure wasn’t me. Those paper me look like the pepto bismol commercials-heartburn, nausea, indigestion, upset stomach, etc. I don’t get flu shots cuz I don’t get sick. the longest I’ve been sick the past several years has been a day, and I still feel pretty good. Most of the time, if I wake up feeling like crap, like the beginning of sick, I take a Zicam, maybe some advil, go to work, come home, go to bed, then I feel perfectly fine in the morning. I have only had the flu after getting a flu shot I didn’t want, and that my doctor INSISTED I get. Jerk. The flu hurt. Otherwise I get sick about once a year. Biff: What have I done?!? more seriously the extended caption makes me wonder about those people who campaign against measles / mumps shots and the like. probably because they themselves had it when they were too young to remember the event, and haven’t experienced the true nastiness of the potentially-fatal diseases they’re immunised against (but the kids they want to “protect” would then suffer), instead getting wound up by fear over a much more infrequent psychological condition. and arguably suffering from one. l being inside my arm… (here’s the irrational bit) I’m afraid i’m going to twitch and the needle snaps then I start writhing in pain working the needle deeper… Yay for irrational fears. Also, I’ve lived in the same city all 18 years of my life, so I’m immune to all the local diseases by now. However, I’m movin to NY soon… Actually (train of thought choo-choo!) once, when my Gran came to visit from NY I picked her up at the airport… And the next day I was sick, but she wasn’t. I got a NY bug from her! Oh well that’s 1 disease down 109900 to go!